So after several years using Streufex, our barn has switched to straw--a special kind of straw, though. What was wrong with Streufex? 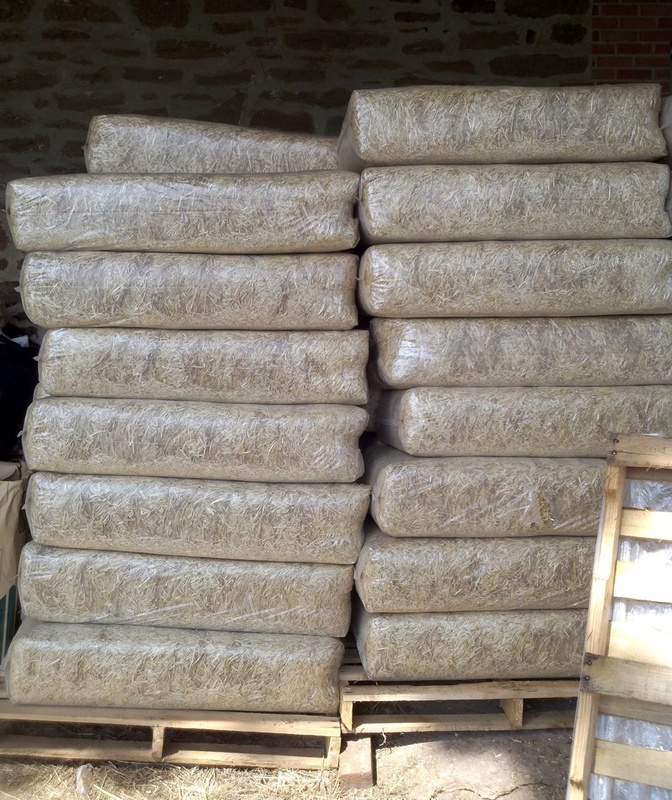 There is nothing quite so lovely as a bed of good quality oat straw. 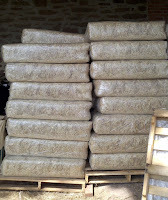 That's what we're using now, and it comes from a local supplier who delivers chopped straw in bags. The cost is less than Streufex. It's light, and fluffy, and easy to muck. It was initially a little slippery, but now we're coating the floor with gypsum to absorb the wet stuff and give the floor traction. Okay, not really green, but it's being re-used! The mushroom growers are reportedly taking it and even paying for it. Imagine how much the owners like that. Even the bags the straw comes in is being re-used, we return it to the farmer to restuff with straw. You know there has to be a downside -- it isn't quite as absorbent as shavings, and the mushroom growers won't take straw with ANY shavings in it (so I can't bed under the straw with shavings). So Riley is one of two horses in the 20 horse barn still on shavings. I'm supplementing the shavings with pine pellets. 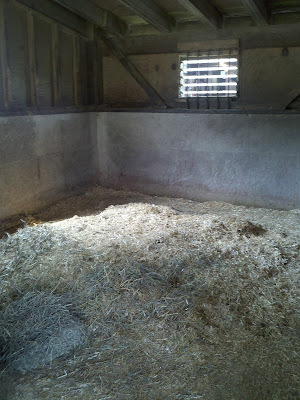 A layer of pellets in the center of the stall really extends the life of the bedding. The wet accumulates there, and it sits there (doesn't redistribute to the rest of the shavings. Top stays dry, like a baby's diaper. We have open air stalls, so our barn doesn't bed, but I add pellets to our sandy footing. I love pellets! They absorb all the wetness and blend into the sand nicely. This gives the horses more cushion, doesn't blow away in the wind, and is easy to sift when cleaning. Since my board bill doesn't include the price of bedding, it does get a bit expensive, especially with two horses, but it does make their lives more comfortable. If I remember correctly from university streuflex was created from straw. We used to have chopped straw (Called chaff) for the cows, wonderful stuff to muck compared to baled straw. First, thank you for suggesting those scoop rakes. I don't remember the official title, but we saw one and bought it on your recommendation - and what a wonderful thing! We have stalls with back doors which are usually open to large runs. (Large = the smallest is 24x80 feet) This means shavings are drug out by hooves and blow out, too. We have nice rubber mats down under them, so don't have to keep the shavings as thick as we would on concrete or packed dirt. However, we would like to be able to keep more shavings in the stalls. There's a certain tipping point after which no additional shavings will stay in the stall no matter what - 3 bags added or 1 bag added, by 6 hours from the time it's put in, the shaving level in the stall is the same. We were considering trying pelleted shavings. We've been told you have to wet them first - but it sounds like you use them dry and they then expand as they absorb urine, probably? If so, a combination of them and regular shavings sound like it could work really well for us! I haven't seen straw at any of the feed stores around here. Having grown up with horses in unbedded outdoor pens I found it strange not to see straw for horse bedding when I saw bedding, given all the books I read as a kid discussed the use of straw! I assume it's related to available crops/industry in the area we live. Will your farmers not take Streufex? I've used that or generic straw pellets anywhere we were required to use straw, and never had a problem with it. Usually by the time it gets picked up the pellets have already washed away or broken down. I've never tried the chopped version, but I hate mucking straw stalls more than just about anything! Sounds good. I don't usually bed my stalls too much if the horses are in and out all day. Right now, with two in on layup, I am using shavings. 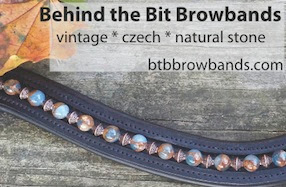 Bit of a bother, but that's what I'm used to. I tried regular straw once and regretted it as it's not easy to clean. Streufex sounds much better. We don't stall our horses.... but when we go to shows, we bring a bale or two of straw to use in their stalls instead of shavings. Straw is hypoallergenic and much less dusty. Also... I honestly think the horses prefer it. It's better for the environment.... and easy to compost. And it's not just mushroom growers who use it.... plant nurseries and landscaping companies like to use straw to mulch their beds.... particularly going into winter. Nice. I remember mucking out regular straw bedding; major pain in the tail. Then in college it was shavings (way easier). The cut version looks like it would be pretty muckable (ha).